"Don't forget your jacket," my mom called as I headed for the door. "It's cold outside!" Annoyed, I set my jaw defiantly, bypassed the coat closet, and ventured out with bare arms. I'll show her, I thought. I'm too old to be bossed around by my mother. I make my own decisions. If you're wondering why I'm dredging up thirty-year-old adolescent memories, think again. The scene described happened just last week. 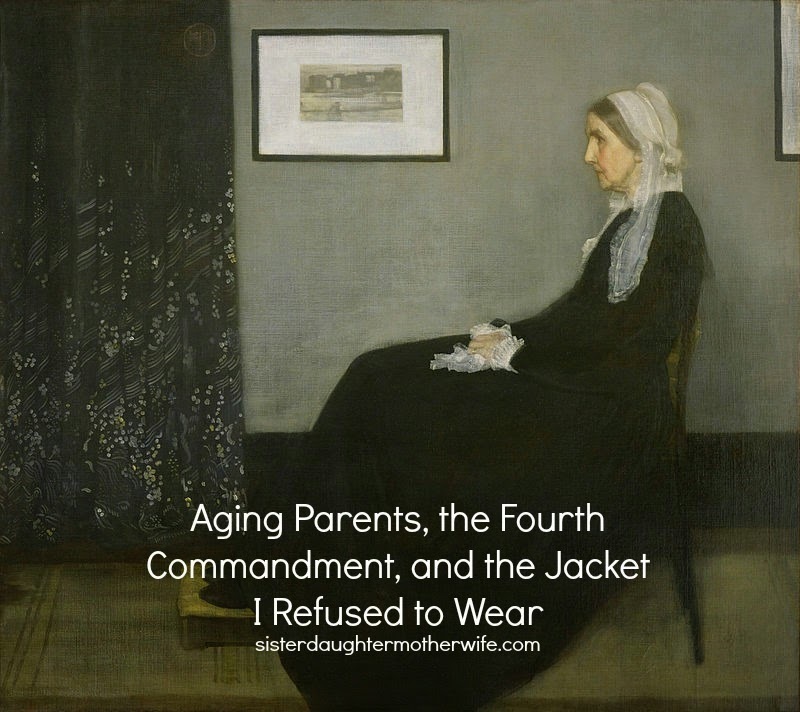 One of the more difficult things about growing older is learning how to relate to parents who are also aging and changing as they do so. When the parent-offspring relationship is clearly that between adult and child, the interactions are a lot more direct. The parent makes decisions; the child abides by them (or suffers the consequences). But as the child becomes an adult, first a young one and then a middle-aged one, and the parent progresses from middle-age to senior citizen status, the familial landscape becomes much more confusing. Put the parent and adult child in the same house, throw in some garden-variety dysfunction for good measure, and the landscape goes from merely confusing to downright chaotic. If it sounds like I know what I'm talking about, I do. My mother has lived with me for the last four years. The result is that all the usual challenges of the parent/adult child relationship are writ large in our house. It seems not a day goes by that I don't have a wrestling match with the Fourth Commandment. And more often than not, I am the one who ends up pinned on the floor, face ground into the mat, arms immobilized behind my back. If I have any sense at all, I quickly submit. In response, Mr. Fourth Commandment gets up, brushes off his hands, and smiles triumphantly, knowing that it's only a matter of time until I try to take him on again. But certainly that commandment is not intended for me, a 50-year-old woman with an 84-year-old parent. I'm all grown up now. And my mother can be so difficult. Surely God will grant a little wiggle room when it comes to my keeping of this particular law. 109. Learn, therefore, what is the honor towards parents that this commandment requires. (a) They must be held in distinction and esteem above all things, as the most precious treasure on earth. 110 (b) In our words we must speak modestly toward them [Proverbs 15:1]. Do not address them roughly, haughtily, and defiantly. But yield to them and be silent, even though they go too far. 111 (c) We must show them such honor also by works, that is, with our body and possessions. We must serve them, help them, and provide for them when they are old, sick, infirm, or poor. We must do all this not only gladly, but with humility and reverence, as doing it before God [Ephesians 6:6–7]. For the child who knows how to regard parents in his heart will not allow them to do without or hunger, but will place them above him and at his side and will share with them whatever he has and possesses. "But yield to them and be silent, even though they go too far." He can't be serious, can he? Even when they are cantankerous and difficult and negative and passive-aggressive and habitually critical? Even when they seem not to appreciate the sacrifices we are making in trying to honor them in their old age? Even when they make us feel like failures because they are so adept at pushing all those buttons that bring out the worst in us? Even when they act more like our children than our parents? Yes, even then. When our parents become in some ways like our children, and we are more responsible for their well-being than they are for ours, the necessary mental and emotional adjustments can be incredibly difficult. The person on whom I depended for my bodily preservation is now dependent on me. The person to whom I ran for comfort in the face of life's challenges is now someone who needs me to be the comforter. What is wrong with this picture? Nothing is wrong with this picture. It is what God calls us to do, difficult as it is. 167. In addition, it would be well to preach to the parents also, and to those who bear their office. Tell them how they should behave toward those who are given to them for their governance. This is not stated in the Ten Commandments. But it is still abundantly commanded in many places in the Scripture. God wants to have this included in this commandment when He speaks of father and mother. 168. He does not wish to have rogues and tyrants in this office and government. He does not assign this honor to them, that is, power and authority to govern, so they can have themselves worshiped. But they should consider that they are obligated to obey God. First of all, they should seriously and faithfully fulfill their office, not only to support and provide for the bodily necessities of their children, servants, subjects, and so on, but, most of all, they should train them to honor and praise God [Proverbs 22:6]. 169 Therefore, do not think that this matter is left to your pleasure and arbitrary will. This is God’s strict command and order, to whom also you must give account for it [1 Peter 4:5]. Living with or caring for an elderly parent on a daily basis can be a daunting task. Sometimes those of us who do it are referred to as the "sandwich" generation because we are at the same time still rearing our own children. Having been in this phase of life for several years now, I have learned enough to have some practical suggestions on managing the situation. It is illustrative of the challenge of serving others that these are things I find myself failing to do more often than I would like to admit. 1) Accept that as both you and your parent age, your relationship is naturally going to change. This is a painful but unavoidable truth. There is no way to avoid grieving over this change, but the sooner you realize and accept it, the sooner you can begin to adapt to it in healthy ways. Don't hesitate to seek counseling if the adjustment is overwhelming. As mentioned earlier, you may be called upon to significantly adjust the way you interact with your parent, relating to him or her more as an adult would to a child or a caregiver to a patient. I have found that the conscious practicing of a certain degree of emotional detachment is helpful to maintaining my sanity while doing what needs to be done. Children and sick people do not always know what’s best for them. Those responsible may need to make hard decisions, and some emotional distance can be very helpful in doing so. 2) In that same vein, be proactive, anticipating issues to the extent possible before they come up. Due to the variety of demands on my time, my schedule is rather confusing. Each day looks different from the rest, and this was a source of stress for both my mom and myself as she couldn’t keep track of my comings and goings and I was frustrated by the constant asking of questions (and forgetting of the answers). So several months ago I finally got smart enough to print up my regular schedule and stick it on the refrigerator. It is not always accurate, as there are regular deviations from it, but having it there in black-and-white for my mom’s reference has helped a lot. She feels more secure, and I feel less hassled. 3) Honoring one's parent does not mean submitting to mistreatment. Setting boundaries is good and helpful for all parties. When one of those boundaries is overstepped, it is appropriate to point it out. The trick is doing so constructively. You can answer passive-aggressive behavior with more of the same, or you can have a conversation in which expectations and consequences are clearly communicated. Doing the latter does not always lead to a change in behavior, but at least it won’t make things worse. 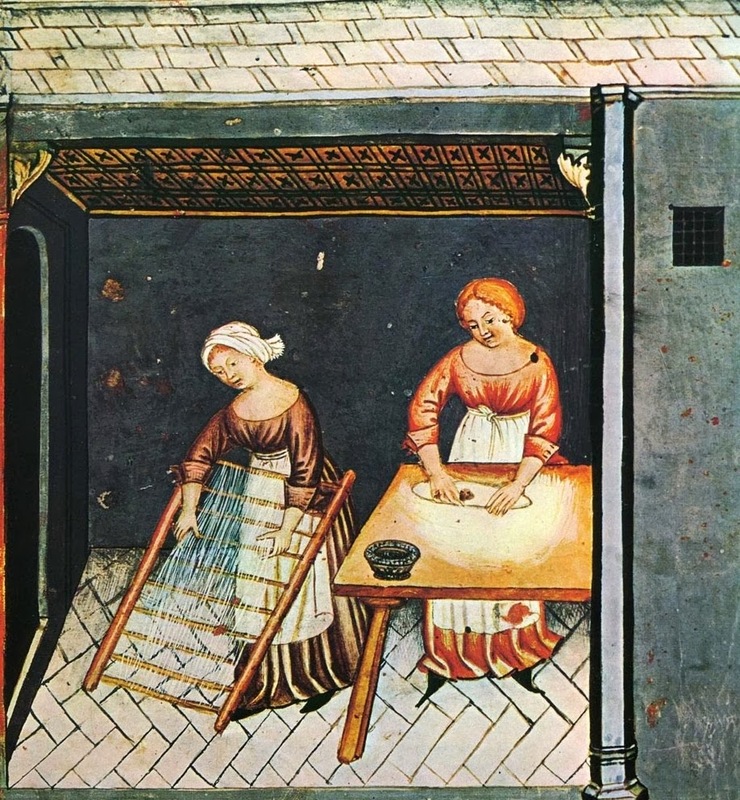 To give an example, in my own house the management of the dishwasher became a huge point of contention. (I know--really? Yes, really.) In truth, it was a flashpoint for other issues. When we realized this, we set a policy that mentioning the dishwasher was off-limits. It had simply become too much of a catalyst for unhealthy communication. Now, did that immediately solve the underlying problems? No, but it did create one less brush fire with the potential for widespread destruction. Having set the rule of no dishwasher talk, I was better able to refuse to engage when my mom brought it up. 4) In addition to counseling support, avail yourself of other resources that may be able to offer assistance. These could come in the form of family members or friends who can step in and provide relief care, or in the form of private or public services. We have used the Visiting Angels service to check in on my mom when we are away. Most cities, even smaller ones, have a senior center with activities and information on elder resources. Help is truly sometimes just a mouse click away. 5) Don't be a martyr. There may come a point at which you can no longer bear the load. Reaching that point does not make you a bad person; it just makes you human. It can be a great blessing to have a parent live with you rather than in an assisted living facility or a nursing home, but it may not always be sustainable. If and when the time comes that you have to let go of some measure of responsibility, it doesn't mean you are a failure. It may in fact be the wisest, most caring choice you can make. 6) Realize that you will fail every day--um, make that every hour. When you do, pour out your sin to God and ask for forgiveness as well as the strength to do better next time. And when you fail again, repeat the cycle. In time you may be surprised to find out that not only is God's store of forgiveness inexhaustible, but He is actually answering that prayer to help you do better. "In what You give us, Lord, to do,Together or alone,In old routines or ventures new,May we not cease to look to You,The cross You hung upon--All You endeavored done."